Inevitably, I loose my “voice” and go silent for weeks at a time. Blog wise – NOT in real life. Heaven knows not much keeps me from talking. (This is a joke… you should smile politely and nod knowingly…) Nothing personal against the lovely 1000 degree days we’ve had as if Indiana has been channeling Arizona… it’s led to a bad summer for me. The kids have loved it – and being out of school however, and they’ve never had need to ask to turn on the hose or sprinkler. In a one room cooled – via window unit house – cool kids are happy kids (which leads to a nice and sane mom). I have missed almost a whole month on here… and since then both my son and daughter have had birthdays – and even yours truly! Yep – I’m blessed with more gray hair and another year of life with my wonderful family. They were soooo good to me on my birthday! 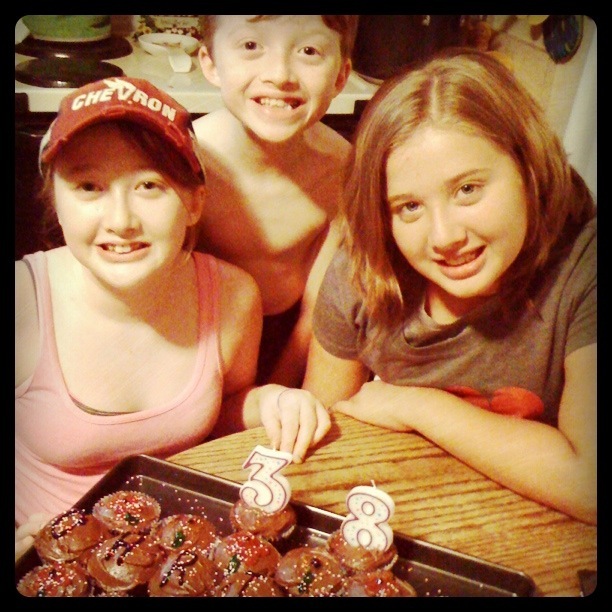 (See – they made me cupcakes WAY better than anything CakeBoss could make). It was to be a surprise and they baked it late at night, but then were so excited, they had to have me come have one right away (because it WAS actually my birthday, after all. Upon seeing chocolate, and smelling those baking delights, I didn’t argue a bit!) So I snapped this picture because I knew it would be worth it’s weight in birthday gold. My kids aren’t little any more. They are baking ME the cakes, instead of the other way around. Some pride in that of course, because yours truly taught them their amazing cooking skills 🙂 but also just still surprised at how fast time goes. Really. June and then again in July too, were mostly icky. Some good days thrown in, but it’s been so many down days that the kids just assume they are on their own vs me running their day for them. I seriously HATE that. Icky sounds sorta tame. It’s really been more like hellish. That sounds whinny I know… sorry. I am learning that so much of my life can be planned around the pressure fronts that move through that I really should consider taking up weather forecasting for the local news station. I have not been wrong yet – though they are not always on target. My body seems to have a built in weather vane. What did I, OF COURSE, DO? Too darn much. It’s in my nature. It’s what I DO the best. If I have a good day – I really make it count! But the good thing about having so many not-so-go days is that it is making me start looking for solutions again. I sorta stopped. Ever just get so tired, so worn out you just existed day to day vs living with an ToDo list, and a year long idea of plans to happen? I never did… Not till this past year. I’ll admit it out loud – I’ve done with “shocked” at there’s something wrong with me, gone past “frustrated”, through the “mad” phase of this thing, and I’ve moved into the bit “scared” stage. Eventually I will get to “head strong and stubborn” and “refuse to be ruled by circumstances” stages. I know the way I work. But I’m honestly not there yet. Some new changes are muscling their way into my daily life in ways I don’t like, and they are taking me to places that I’ve never had to be. And they are lonely places. I really don’t like lonely. I like well lit happy places that are full of friends, laughter, and a bit of chocolate for good measure. But I don’t know what to do with this new place. And I’m dry enough spiritually from missing my devotional time, and church so much that I’m closing in on a personal place I haven’t been in a long while. And for whatever reason, I’m having a heck of a time finding a way to just seek out God. It’s almost as if my subconscious is mad at Him in a way that’s turned her back His direction and refusing to talk. I know all this – yet I’m not getting much farther along in it for all the self analyzing. So, I called my family doctor and had a sit down. I wrote him a book full of my questions because I just cant remember things. (which was one thing on the list!) In the past he had referred me to a specialist, who then rocked my world just over a year ago diagnosing this Chiari thing and helping me connect missing dots. It’s taken that long to decide that it’s not about getting better any more. It’s about not getting worse. Yep. I’m still praying and hoping for better… but the big idea here is not getting worse. Honestly? I really don’t even want to know the answers a new specialist may bring – but somehow I am oddly ready for whatever they throw at me. I’m ready for my family to have me back far more than I’m ready for ME to think beyond living day to day. I guess I think more highly of them than I do myself. My husband said to me that it was time to honestly look at this as more than existing and begin looking at how I am live the next year, the next 40 more years of life (or more) – not just one day at a time. I don’t know when I stopped – but when he said those words, the tears poured down and I realized I had. I’ll go to a Neuro Research Center in September to look into why I am having some possibly serious underlying issues that could be due to compression in the brain stem from the Chiari Malformation. Even saying this in print sounds icky. I’ve moved from having twitchy like movements, to involuntary abdominal and back contractions at night, to having them whenever at rest sitting or laying – and now even when standing up doing something. That was always my way out – to just get up and go do something. It would stop the contractions and let me catch my mental breath and give my body a break before attempting sleep again. My husband was standing beside me two days ago when my mental wall was broken and I nearly spilled a pop I was pouring when a ripple hit me standing in the kitchen. Never thought I’d say September couldn’t come fast enough. I just want to move forward… whatever it is. Does that mean I’m past scared? Heck no. Just means I’m past “hole in the ground” and “this isn’t happening”, I guess. I long ago decided the risk of surgery did not outweigh the benefits when the issue was headaches. I’d just deal with it… no matter how bad it got. It’s funny how you go from one frame of mind to another when faced with how it affects the lives of your family than just your own. Okay, God… I don’t know what you have planned here in all of this… and I know you are big enough to handle the fact I don’t want any of this on my plate and am not just mad, but am now scared too. So do what you do best. Take it all and make it all for YOUR glory… and make it count. Make it worth all the effort, tears, and the struggles my family face. And even though I still don’t want to, I’ll carry this onward, for You. You are a strong woman. Hang tough. There is only a few more days until September and I really hope they can help you find some answers so you can have that life you so readily deserve.